The opening seremony of the exhibition was on Monday. There where lots of people as you can see in the pictures. Many speeches were given by both universities Donghua and Metropolia. At the moment the three workshops (Tai Chi for Beginners, Patient apparel for Children and Moving in the Cities) led by Metropolia staff are still going on. The participants of the workshops come from both Finland and China. Yesterday we had a press conference and there were over 20 journalists asking questions and taking photos of our exhibition. The workshop “Patient Apparel for Children” got great publicity. The idea of planning children´s patient clothing was a great success and really new here. Tomorrow (on Friday) there will be a decision makers seminar “Well-being for All”. There will be experts, e.g. leaders from Espoo city and of the Donghua and Metropolia University. The exhibition is very very beautiful. We are so sorry that we can’t bring it to Finland because of the transportation costs. The Exhibition Week will end on Saturday. After that only the data projectors will be transferred to Finland. So everyone near by, please come and enjoy the wonderful exhibition with us – now! 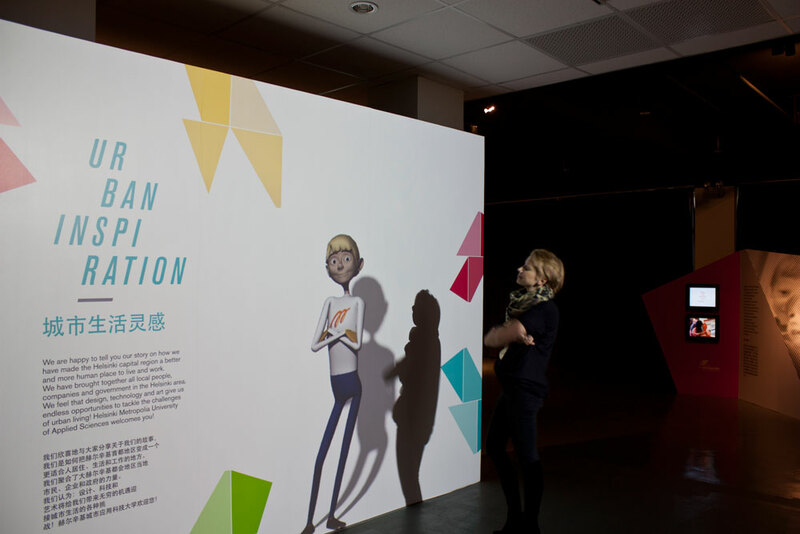 The animated Metropolia man (3D) welcomes the visitors to the exhibition hall.